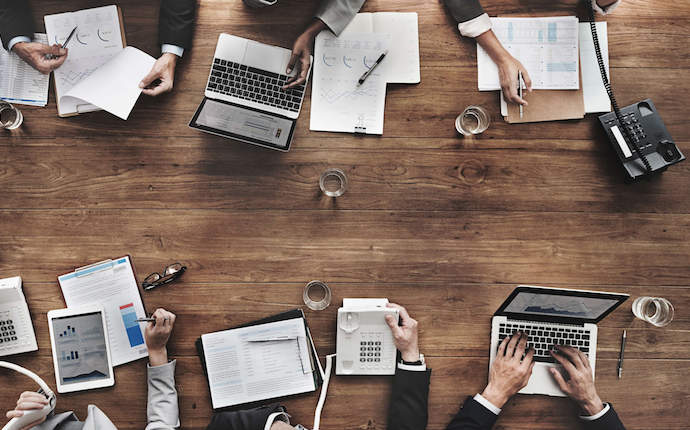 Enrollment in the Affordable Care Act's new Individual Health Insurance Marketplaces has attracted widespread attention from the media and industry insiders alike. So, what does the public think about the latest announcement that over 7 million Americans signed up for ACA Marketplace coverage? Who is shopping on the Health Insurance Marketplaces, and how is their online experience? According to an April poll from Morning Consult, the announcement had little impact on the public's overall opinion on the Affordable Care Act, aka ACA or "ObamaCare". And, the online Marketplace experience remains positive. Here are the key findings. 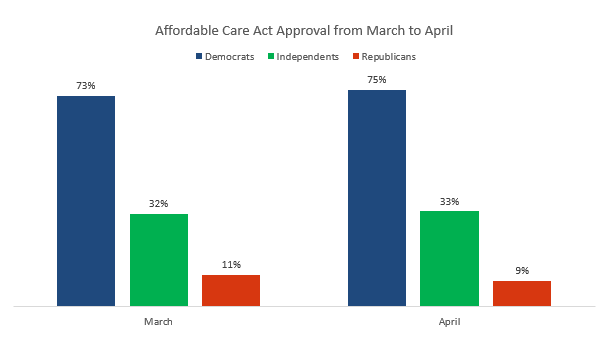 According to the poll, approval of ObamaCare law among Independents remained constant at 32 and 33 percent in March and April polling, respectively. Seventy-five percent of Democrats approve the law, about the same as in March (73 percent). Only 9 percent of Republicans approve of the law today, compared to 11 percent in March. 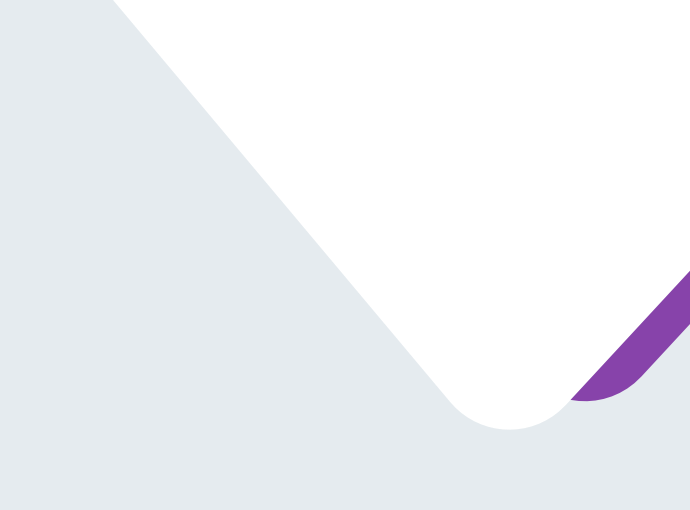 According to the April poll, 55 percent of respondents who visited an online Marketplace said their overall experience was “Very positive” or “Somewhat positive”, compared with 57 percent in March 2014, 56 percent in January 2014, 50 percent in December 2013, and 52 percent in November 2013.
Who is Using the Online Marketplaces? Over the past five months, more than half of those who said they visited a Marketplace (55 percent) are under 45 years old. The largest single age group to visit the Marketplaces is adults 45 to 64 years of age, at 38 percent. 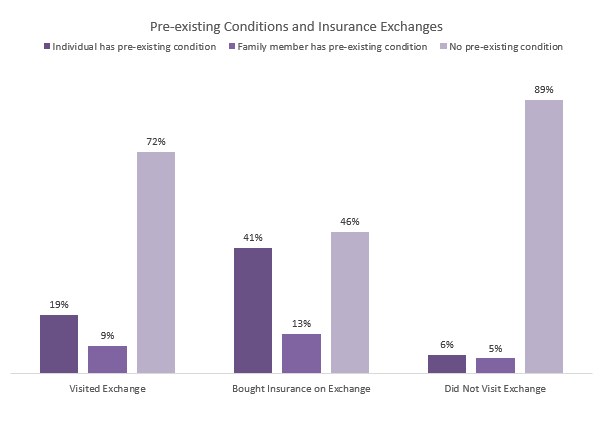 More than half of respondents who purchased health insurance on the online Marketplace (54 percent), reported that they or a family member had a pre-existing condition and had previously been denied health insurance based on that condition. The April tracking poll was conducted from April 3-6, 2014, among a national sample of 1,906 likely voters. The interviews were conducted online by Survey Sampling International, Inc. The data were weighted to approximate a target sample of likely voters based on age, race/ethnicity, gender, educational attainment, region, annual household income, home ownership status, and marital status.